My friend Bill Gunlocke, founder of the erstwhile Cleveland Edition, is a timeless sort of guy. Which is why it seems all the more hard to believe that he's celebrating this latest milepost in his life. To me, he'll always seem fixed at about 43, just like his contemporary Bill Clinton. But then, 60 is the new 50, they tell me. Bill G. is a little quieter a guy than Bill C. (who celebrated his 60th last fall in his usual loud fashion). He now lives in Manhattan, and recently sent along the photo above, of a night out in a quiet pub in his honor. Those are two of his three daughters above, as well as a son-in-law. He keeps a young outlook in all the usual ways, and then some. Of course, there's his mountain of good reading. He also edits a fine neighborhood newspaper in New York, where he's again assembled his trademark stable of talented young writers, fresh out of college, whom he prods and challenges for as long as they stay, before he breaks in another crew. And for good measure, he even recently began his own blog, which he uses to post his weekly editorial online. 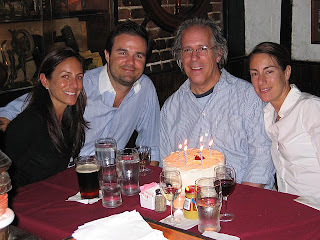 Congratulations on the birthday and the new blog, Bill. May you continue to write and reading (and enjoy living in NY) for many more decades. distinctive bunch of writers. As in the case of many publications, Cleveland's loss was its inability to support the uncoventional. Very well said, Roldo. Obviously I agree with you about the Edition's distinctiveness. I find it almost funny (if it wasn't so sad) how it continues to live on in so many people's memory, so fondly. Only today, I learned that yet another of our old Edition colleagues, Jeff Hagan, has a new web presence (not quite a blog, but not quite a static website either). And on his clip page, he prominently mentions his work on the Edition (which he calls a pub "more curated than edited"), as well as the work of others. And this, for a paper that's now been dead for a decade and a half. blah blah blah. he still owes me 50 bucks. Don't feel too bad. I never collected for a final cover story, a whole $350. But I wrote that off as lost income an awful long time ago. I just put it under the education column. I just wrote this to Bill and gave you guys mad props, too. Time for some help with this one. I know you're The Man for it because this story has wings and major media is finally coming around to it but they are going to have to eat crow. Call me so I can explain more. And then we can have lunch. I'll hop on the damn Fung Wah or you can come up to NH. It's been 20 years, man. Saw you on John's blog. You look great. Catching up with Ken Blackwell and his pot-smoking hypocritical son. Lotsa laffs from New England.